In the coming months U.S. Internet providers will begin to warn and punish alleged copyright infringers. The six strikes plan is the result of a deal between the MPAA, RIAA and several large ISPs. However, only a small minority of U.S. ISPs are participating and many were never even asked to join. Talking to TorrentFreak, the CEO of Sonic.net argues that its not the task of ISPs to police the Internet, and that the entertainment industry should work on improving their business models. Later this year, the Center for Copyright Information (CCI) will start to track down pirates as part of an agreement all major U.S. Internet providers struck with the MPAA and RIAA. The parties agreed on a system through which copyright infringers are warned that they are breaking the law. After six warnings ISPs may then take a variety of repressive measures, which include slowing down offenders connections and temporary disconnections. While weve written a fair number of articles on the topic, many people assume that all ISPs are part of the agreement. However, this is certainly not the case. In fact, only five Internet providers have agreed to send out warnings to their customers. 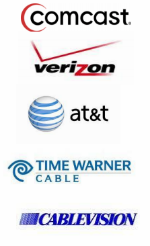 In alphabetical order these are AT&T, Cablevision, Comcast, Time Warner Cable and Verizon. In total the ISPs above cover roughly 75% of all U.S. broadband internet customers. This is significant, but it nonetheless begs the question  why are the rest of the providers not involved? Quite a few prominent names are not listed. Centurylink, Charter and Cox all have millions of subscribers, but are not taking part in the six strikes scheme. Not to forget the 100+ smaller providers across the United States who are also missing in action. Luckily Dane Jasper, CEO of the much smaller Sonic.net, was willing to comment on the efforts to make ISPs responsible for online piracy. He told TorrentFreak that ISPs are not setup to police the Internet and that the entertainment industries should look for a solution closer to home. ISPs provide an essential utility: connection. We are not equipped to police the actions of individuals, Jasper says. However, the above is not the reason why Sonic.net isnt taking part in the six strikes scheme. As it turns out, the RIAA and MPAA never bothered to ask Sonic and many other smaller Internet providers to join in. It isnt because we refused, but because we were not asked. I know at least 100 small to medium ISPs through my trade association memberships, and have heard of no independent ISPs being approached at all, Jasper says. Its not clear why they were left out, but its likely that it would have been too much trouble to reach consensus with so many parties involved. When it comes to finding a solution to online piracy Sonic.nets CEO is clear. The entertainment industries should ensure their legal offering is superior in terms of convenience and availability compared to that offered by pirates. Jasper believes that taking away peoples incentive to pirate is key, and he mentions Pandora and Spotify as good examples of services that are able to deflate piracy. The point is that the music business has had to evolve to survive, moving away from albums and record stores to more innovative methods of distribution that consumers have responded to rather than turning to piracy out of an unwillingness to participate in the old model, he says. I suspect that Apple TV, Roku and Netflix have similar beneficial effects on video, but a lack of uniform availability plus rather high prices and restrictive viewing terms hold back this solution, Jasper concludes. The MPAA and RIAA would not directly disagree that innovation is an important factor to curb piracy. But nonetheless, they hope that warning emails will also help. That people can bypass the scheme by using a VPN, cyberlockers, or even switching ISPs doesnt change a thing. At this point it is still unknown when the first warning letters will be sent. It is expected that the first ISPs will start later this year, and each will roll out their participation at their own pace.